Israeli army jeeps invaded, on Tuesday morning, several towns in the southern West Bank governorate of Hebron, and summoned one Palestinian for interrogation, in addition to installing many roadblocks. Media sources in Hebron said the soldiers invaded Doura town, south of Hebron, before storming and searching homes, and summoned a former political prisoner, identified as Eid Ibreiwish, for interrogation. They added that the soldiers invaded many neighborhoods in Hebron city, in addition to the towns of Ethna and Yatta, and installed roadblocks at the entrances of the towns of Halhoul and Sa’ir, and Hebron’s northern entrance. 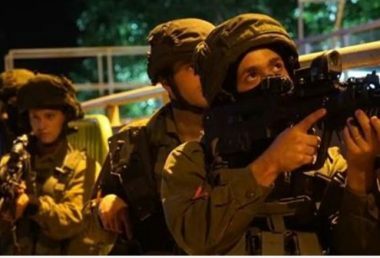 On Tuesday at dawn, the soldiers abducted four Palestinians, including two children, from the West Bank governorate of Bethlehem, south of occupied East Jerusalem, after invading their homes and searching them, and summoned one for interrogation. In related news, the soldiers abducted seven Palestinians, including a father and three of his sons, in the Ramallah and al-Biereh governorate, in central West Bank.